Fortunately, there was no one in our room this time around! 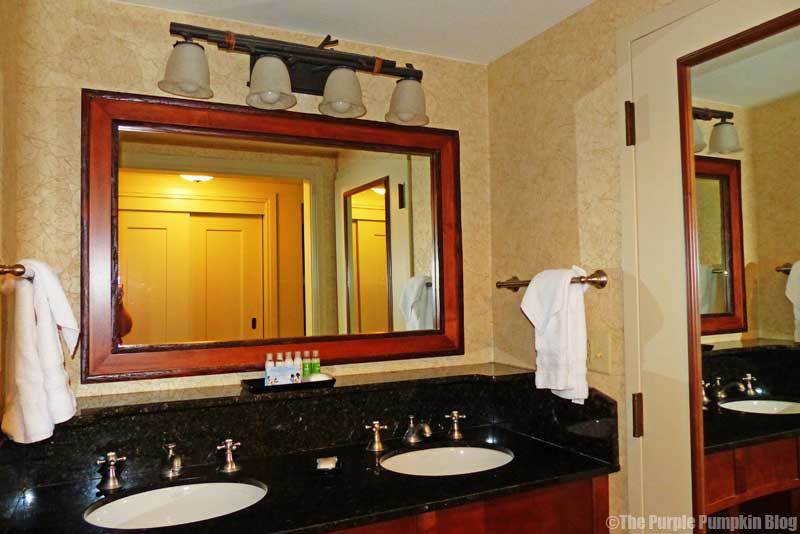 I’d heard that the rooms at Wilderness Lodge are the smallest of the deluxe resorts, so we were pleasantly surprised to find that they were not as small as we had feared! Sure they’re not as big as the huge room we had at Old Key West in 2014, but there was ample space for the three of us. 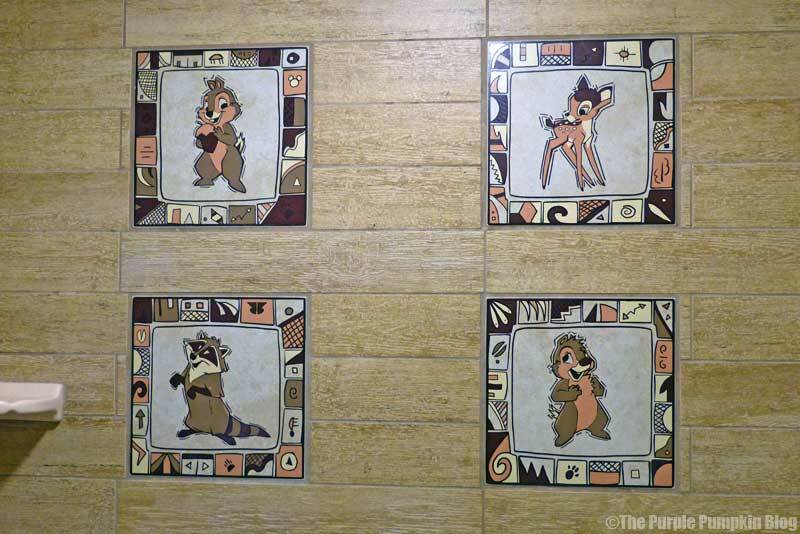 Once again, the attention to detail and the themeing was spot on: The rustic bedsteads, with wood carvings on the posts; the rich, warming colours of the carpet, and curtains; the wooden table, chairs, and TV unit; the Thumper motif on the scatter cushions; and the Chip ‘n’ Dale, Meeko, and Bambi tiles in the bathroom (to remind you, you are at a Disney Resort Hotel), everything just felt perfect for this resort. The double sink unit was separate from the shower/toilet, which was handy. And the space under the unit provided us with some extra storage space too. The fridge, was in a cupboard recessed into the wall, with a coffee machine above it. The safe was quite small, and also needed a key, rather than the larger, digital safe we had at AoA. That said, there was enough room for our valuables. The closet was nice and big – but there are never enough hangers! We brought some cheap ones of our own, knowing we didn’t have enough when we stayed at Old Key West last year. I’d booked a Woods View room. 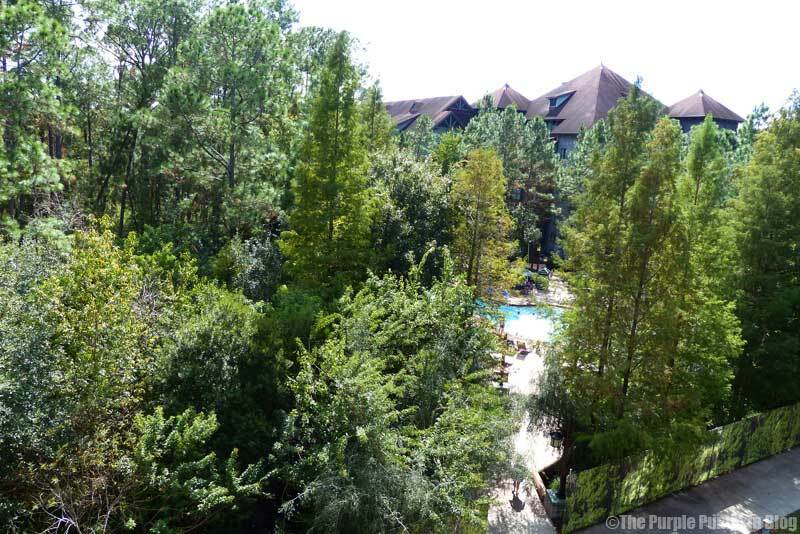 I thought, since I’m staying in a resort called Wilderness Lodge, I want to be able to see the wilderness! 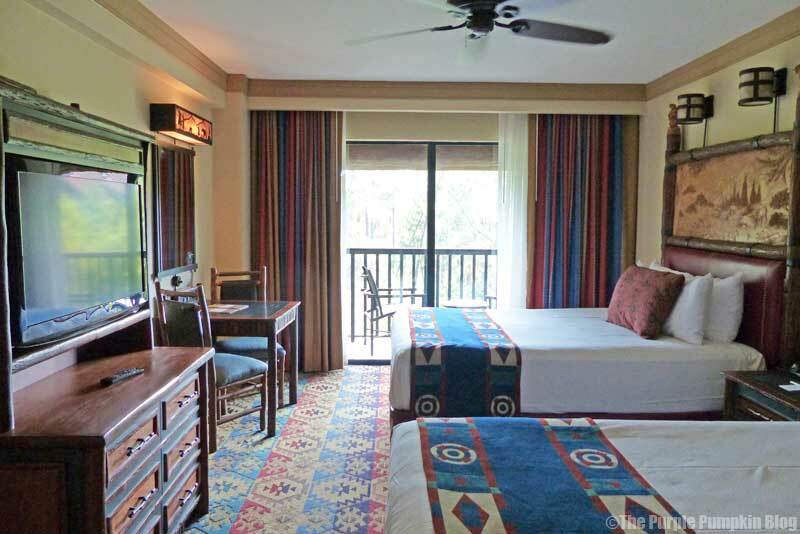 Plus we had such a rubbish view at OKW (air-conditioning units) I wanted to make sure we had a better view this year! Out on the balcony were two chairs, and a small table. The latter of which was procured as a bedside table for me! 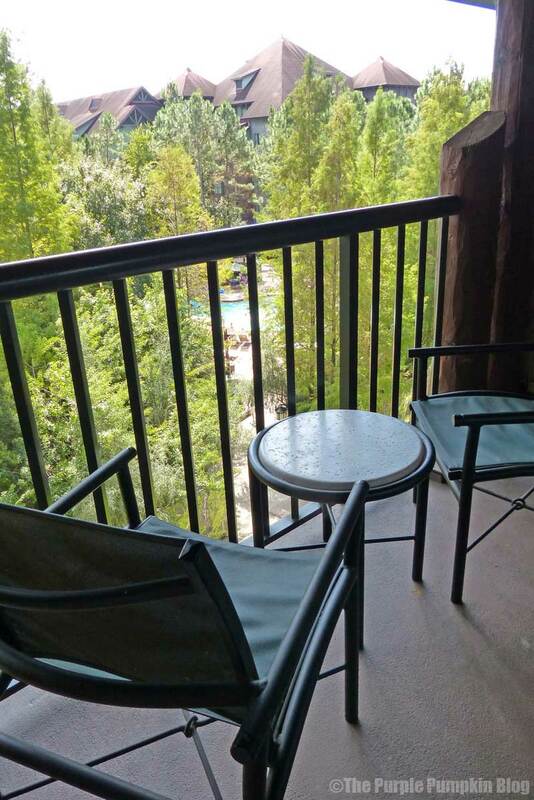 Our view was of the Hidden Springs Pool, directly in front of us, with lots of trees – gorgeous! To the left, if you leaned over a bit, you could just see Bay Lake through the trees, and to the right, again, just a little lean over, you’d see the scaffold for the construction work that was going to be starting during our stay. Liam and Steve went off to get our refillable mugs from the Roaring Fork – the counter service place at Wilderness Lodge, while I started to unpack our stuff. Our shopping (bottled water, and lots of drinks) from Garden Grocer, was not due to be delivered until after 5pm, and we were all gasping! 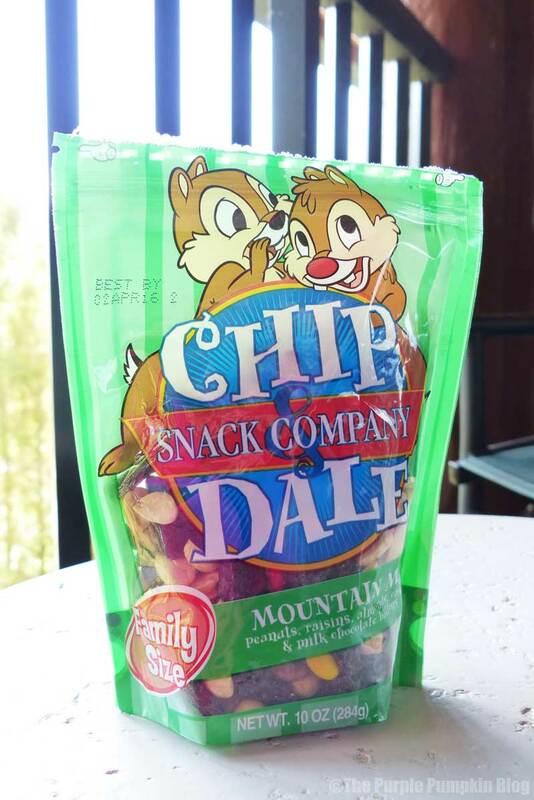 They also picked up our first snack of the holiday – a bag of Chip ‘n’ Dale Mountain Mix, which contains peanuts, raisins, almonds, cashews, and milk chocolate buttons. It’s a huge 10oz bag, and available to buy on a snack credit. The detailing in the rooms just took my breath away at the Animal Kingdom Lodge, they have such incredible attention to detail. I can imagine. 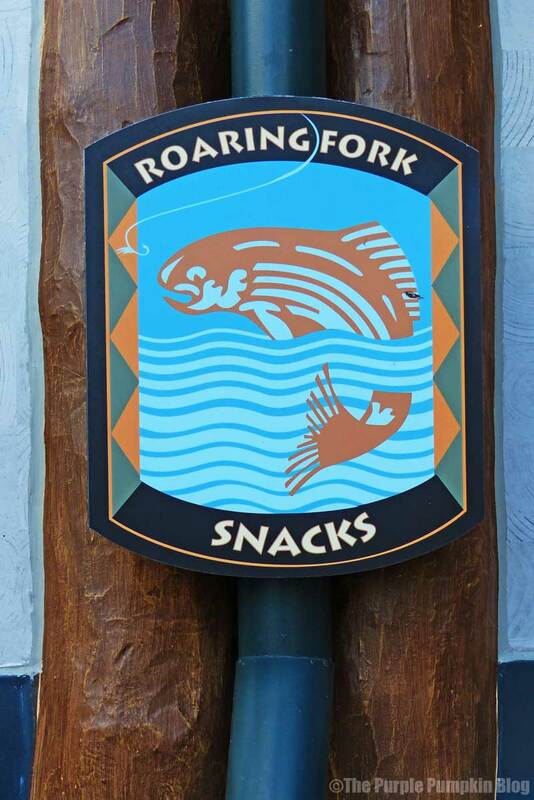 I know we took the DVC tour in 2013, and they were selling at AKL. We didn’t buy then, but part of me sometimes wish we had!